Focus 2 is the second incarnation of the original Focus theme. It features a built in responsive slideshow that scales and morphs your images so that they fit in the browser window beautifully. The slideshow features thumbnail resizing, a download image button, slideshow duration and speed options, thumbnail navigation and more. It's a flexible focussed theme for showcasing your work. Focus2 is a lightweight and fast theme that with a little tweaking can score above 90% in both YSlow and page speed speed tests. Check out the speed test results on the Focus2 demo site. Focus2 features a fullscreen background image slideshow function that makes it possible to display a single or multiple image slideshow in the background of your content. It is also possible to display multiple slideshows on a single page. Need to make your work available for users to download? Focus2 has a download button that makes it possible to download the current image displaying in the slideshow. Bootstrap is not required for the Focus2 template to operate with basic Joomla content views however if you need Bootstrap you can use our selective implementation tool to add the various required bootstrap elements to your design. It's easy to add your required bootstrap elements without adding the entire bootstrap library. Easily create and control your layouts using our draggable layout tool. It's easy to get a visual representation of your site's layout via the layout tool which allows you to hide publish and control modules with an easy to use draggable interface. Focus2 also offers the ability to connect your site to your social networks. Add social sharing for facebook, google plus, pinterest and twitter at the click of a button. Focus2 also features a range of menu tools for creating dropdown, vertical, accordion and offcanvas menus. The Zenmenu plugin makes it possible to add icons, subtitles and multi-column menus to any core Joomla menu module. You can easily add fancy fading, sliding and bouncing affects to entire rows of your content using the built in css3 animation tool. Adding animations to your Joomla template has never been easier. Other fancy features also include a native back to top button, the ability to pin the navigation to the top of the page when the user scrolls down the page. Lazyload offers the delayed loading of images on the page to help speed up page loads and reduce bandwidth for your users. 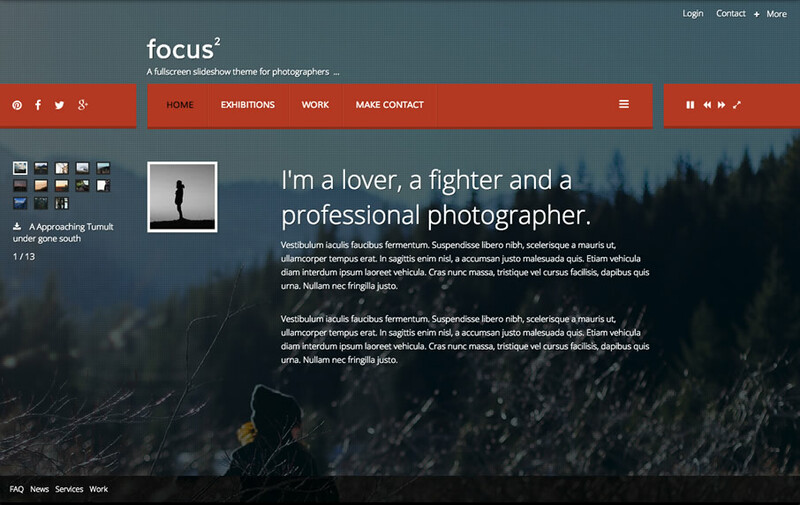 Focus2 also features the ability to create a simple one page smooth scrolling design. The Focus2 demo showcases this function. One page make it possible to use your main navigation to scroll to specified anchor points on your page. One page mode works perfectly on mobile devices via the offcanvas or toggle menu options.